After sneakers, probably one of the more important selections of running gear is the knee sleeve. Why do you ask? Because the knee is a big stress point on runners’ anatomy. From torn cartilage to ligament injuries. In fact, knee injuries are a major problem in many sports and around the world. 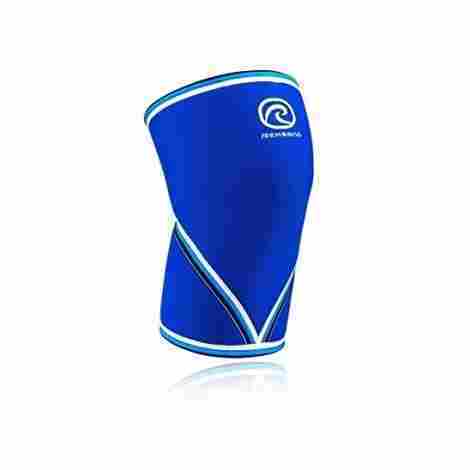 As a rule, knee sleeves are often made from synthetic materials such as neoprene, nylon, and spandex. Simply put, they slide over the knee and limit the kneecap. At the same time, they still allow for mobility and range of motion that an athlete needs. In colder weather, they can add warmth to that portion of the leg that is covered — to reduce muscle strain. In addition, knee sleeves increase sensory awareness of leg movement. Ultimately, helping to maintain proper coordination during running or any exercise. Sleeve compression in the region improves blood flow to the area — thereby reducing swelling and pain during and after a workout. In the end, your body recovers more quickly. If you have any questions in your mind about this subject, it’s wise to consult with your medical health professional. have an amazing fit. Just the right amount of compression and support to protect knees and enhance endurance. Also, they feature four-way stretch capability for added comfort. Incredibly lightweight, they have a double silicone anti-slip wave to prevent slippage. 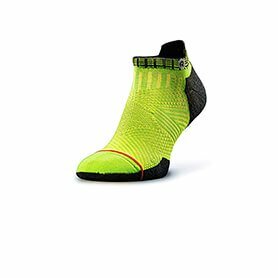 They are well-suited for runners, weightlifters, cyclists, hikers, basketball players and other athletes. 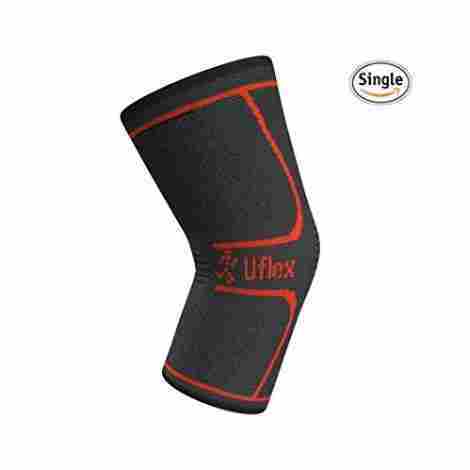 Flex uses the same technology in its knee sleeves to strengthen athletes’ workouts. It allows the sleeve fabric to stretch in all four directions. Maximizing fit and comfort. In fact, they’re fit for the pros! hug you just right to keep the patella comfortably in place and with the maximum blood flow. In that way, you get exactly the right amount of compression that you need to guard against knee Injury and promote muscular health and fitness. comfort and support -- for a variety of sports activities. And they make some of the more fashionable looking ones on the market. Effective compression and good support. Strong, tight but not restrictive. Stays in place even with long distance running. Thin enough to wear jeans over them. The sizing could be more precise. Get one sleeve per package, not two. This line of compression knee sleeves is designed for a variety of heavy fitness workouts including cross training and weightlifting. Seven millimeters in width, they are made from 100 percent neoprene. They provide great support for all body types, too. Expect them to take your workout up a notch or two. Each pair comes with a one-year manufacturer’s guarantee. Whether you’re newer to a regular workout routine or a professional, these sleeves give you the optimum performance no matter what kind of exercising you’re doing. What’s more, these sleeves support weaker joints to prevent problems or discomfort in the region. In fact, the sleeve’s level of compression can actually reduce joint and muscle pain. After a serious workout, we all know that it can take time for muscles to repair themselves. Ergonomically designed with reinforced stitching, the Nordic Knee Sleeve provides the support and flexibility needed to reduce muscle strain and joint stiffness. That means a speedier recovery overall. They are available in different sizes and colors to suit your body type and taste. A newer manufacturer in the industry, Nordic strives to bring big-brand quality to athletes without the big price tag. In large part, they seem to have succeeded. Overall the quality is very good and there are many satisfied customers. Tops in style, performance, functionality, and comfort. Fits like a warm glove. These compression knee sleeves are designed to precisely conform to the anatomy. This feature can help reduce inflammation and pain caused by injury in the knee area. They are specially designed with a silicone lining to prevent slipping down during a workout. In addition, they’re comfortable enough for everyday wear. Recommended for any activity that may put exertion on the knee. Wear them for running, cycling, tennis, cross training and more. Even people with arthritis and tendonitis can benefit from the pain relief Mava Knee Sleeves offer. They follow the contours of the leg and knee for full support but they’re not restrictive. Complete mobility is assured. By reducing inflammation and swelling, imagine how they can help during a regular workout. Mava Knee Sleeves are made from a lightweight fabric that is soft and resilient -- the whole day long. They don’t feel stiff and won’t bind. In fact, as they do their job, you will almost forget they’re on. 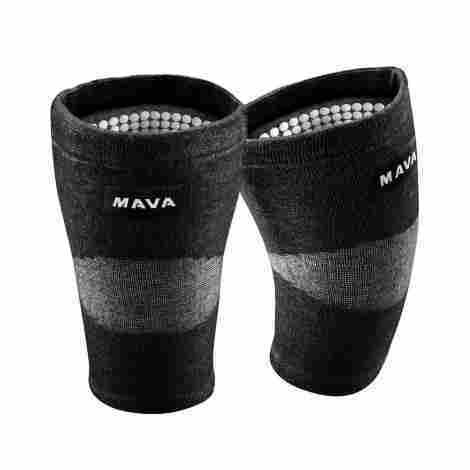 The primary function of Mava Knee Sleeves is to provide healing and recovery after a workout. In addition to giving pain relief from common athletes’ complaints. The quality is decent. Designed for athletes of all ages and skill levels and priced accordingly in the mid-range. Tight at the top and bottom bands. Can roll down after the moderate amount of wear. No matter what sports activity you’re into, you can count on Sable Knee Brace Compression support sleeves. They are specifically designed not to slip. They stay where they’re supposed to stay. And because you get wider coverage above and below the knee, you can expect even pressure distribution throughout. In addition to jogging, they’re tough enough to handle very physical sports including football, basketball, and weightlifting. Made from a spandex/nylon blend, these sleeves get the FDA seal of approval. An anti-slip design helps keep sleeves in place, even with the most rigorous exercise regime. The weave of the sleeve’s fabric is scientifically designed to assure that there is an even and necessary amount of pressure around the kneecap and joints. So any impact on the knee is minimized. Sable Knee Braces are designed for maximum comfort and flexibility. They provide a lot more support than the typical sleeve can. As an FDA approved brace, you assured of good quality. Given it is one of the least expensive braces on the market, it’s an excellent buy. Developed by a team of experts who worked with textile engineers. Its design is unique and so special it’s patented. The sleeve closely follows the contours of the anatomy. Like a second skin that supports where you need it when you need it. For even the most intense physical activity. Together with athletes and textile scientists, Rehband’s research and development group have created a masterpiece in sleeve design. For over sixty years, Rehband has been at the forefront of joint support technology. So you can rely on them for an important part of your workout gear. You can expect awesome compression and equally amazing flexibility -- for just about any activity -- regardless of age or athletic ability. In addition, sleeves help to prevent unnecessary strain and knee problems. As an important maker in compression wear, Rehband has been creating handcrafted products since 1955. During that time they have established a loyal following. Working with athletes and textile engineers, they take their products very seriously. They are widely popular for their terrific quality. A little pricier than many, but a great value for all the quality you’re getting. Running for your health is a no-brainer. The benefits are huge. We all know it’s good for us. But sometimes we can get too much of a good thing. As in joint pain and aches. 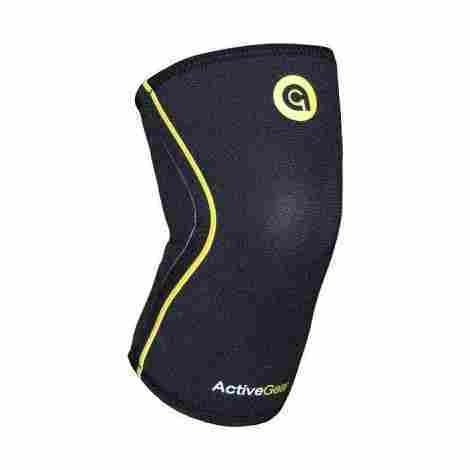 ActiveGear is designed to help relieve the pain and discomfort. Their 3D contouring means you get maximum comfort and fit. No matter what the activity may be. Really the only brace you’ll need to own. For everything from running to heavy weightlifting. The neoprene material provides just the right amount of compression and warmth. Soothing away sore joints and muscles. Made from 5mm neoprene and boasting high-quality construction. 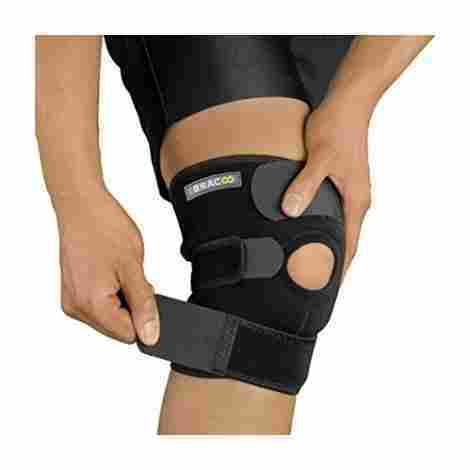 Foam padding and top-notch stitching mean you get a comfortable and long-lasting knee brace. So strong, you can even wear it during rehab. This knee brace is effectively used for post-surgical pain relief. To meet those standards, it has to pass some pretty stringent quality control testing. It’s newer to the market as a sports compression sleeve, but in the mid-price range, it’s a great buy. Holds up after regular washing. Can stretch out over short period of time. 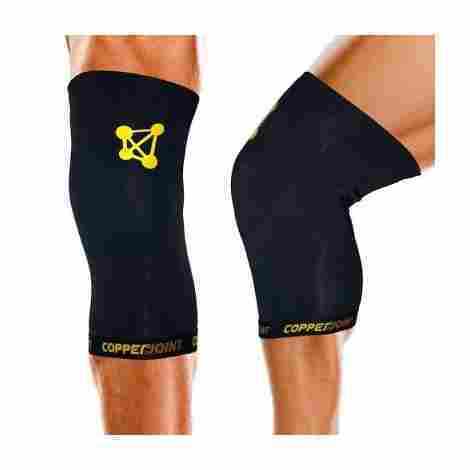 These knee sleeves are specifically made with the athlete in mind. The Bauerfeind Sports Academy works closely with the top echelon of athletes to design compression wear that really does what it’s supposed to do. That is, give you reliable knee support with maximum flexibility. So you can work out confidently and with peace of mind. 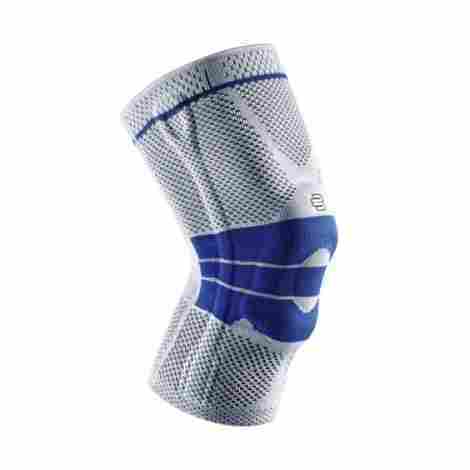 With an emphasis on technology, their AIRKNIT(™) design provides medical-standard compression. That’s important because it promotes healing blood circulation and faster muscle repair. Most other brands don’t come close to this quality and attention to detail. Lightweight and breathable, Bauerfeind sleeves target joints and ligaments -- keeping them stabilized. At the same time, you get all the flexibility you demand even during the most strenuous routine. The Bauerfeind brand is made in Germany. And it appears that they have made a science of compression wear. While one of the more higher-priced sleeves, its comfort is unbeatable and its quality endures and endures. Making it an excellent value in the long run. Attention to quality and detail. Stretchy fabric loses its tautness. These sleeves are manufactured with copper-infused nylon and spandex fabric. This feature provides unmatched support and freedom of movement. In addition, they are lightweight, breathable and resilient for the quick recovery from even the most intense workouts. Form-fitted to the natural contours of your knee. It moves how you move and it still stays in place. So you don’t have the hassle of adjusting and readjusting. There’s no interrupting your quality time at the gym or wherever you’re engaged in sports activity. Supports your knees all day. Graduated compression throughout means the complete range of motion. With no worry about blood clots. You also get just the right amount of warmth for enhanced blood circulation and accelerated muscle repair and recovery. The CopperJoint brand offers a line of compression wear that is suitable for people of all ages and all athletic abilities. Their copper-infused fabric gives great articulation and support for muscles ligaments and tendons. That said, for the money CopperJoint sleeves will do the trick for the everyman athlete and at a very good price. A life saver for knee pain. Little difficulty in taking on and off. Very thin and loose in the wrong areas. With Bracoo it’s all about craftsmanship and technology. 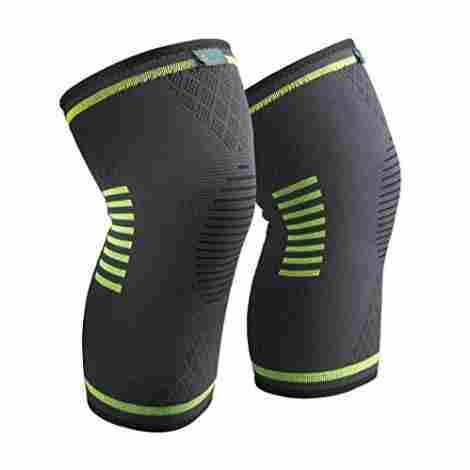 The Knee Support is made from extra thick but breathable neoprene so it keeps your knee warm the way you want. Not sweaty. Its open-patella design assures that the kneecap moves properly when you’re in motion. Again and again. What’s more, the three-strap feature allows you to fine-tune the fit for superior protection against injury. You get the durability of neoprene with the breathability of the fabric. That’s a win-win for you. 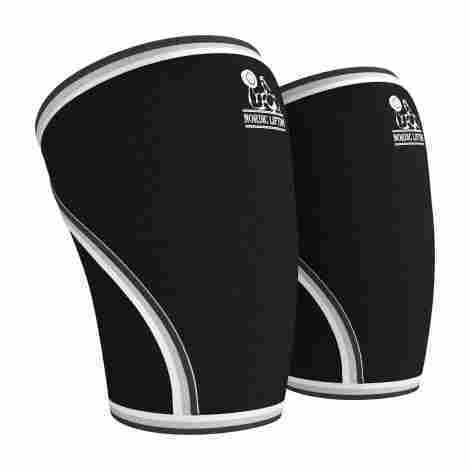 And their innovative open-patella design reduces pressure and increases comfort for longer wear. Equipped with Velcro straps, they can be affixed to just about any spot for as snug or as lose a fit that you want. That kind of flexibility accommodates athletes with a wide range of special needs. An all-purpose brace, the Bracoo performs well for extended periods and provides pain relief from the instability of the kneecap. It is less than half the price of many like braces, making it an extraordinary value. McDavid offers a latex-free neoprene sleeve that is helpful in relieving pain from problems associated with tendonitis as well as arthritis. An exclusive feature, it’s manufactured with a five-needle seam stitch. Giving is not only a flat and clean look but a stronger seam. And for added durability, sleeves have an outer layer of nylon fabric. 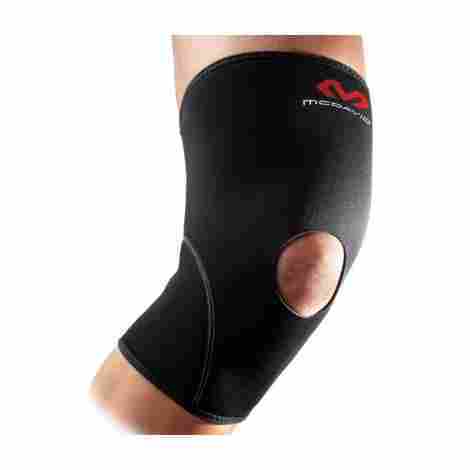 For those with temporary or chronic knee issues, wearing McDavid knee supports can help mitigate the pain. The wonderful support and their added warmth can alleviate many common knee problems. The McDavid Sleeve gives exceptional knee support. It provides the right amount of compression for a comfortable fit. Also, it has a seamless back of the knee for added comfort. It keeps in place, too. McDavid not only sells athletic performance apparel but also has been a pioneer in sports medicine and sports protection products. A lot of effort goes into the research and design of their products. The result is high-quality gear at a moderate price. Lots of cushion and support. Running knee sleeve have tons of benefits for you while working out. While running, you need to maintain a pain free experience. Which the brace wrapped around your knee, you are looking at a successful run, everytime. Now that you have had the chance to review the best knee braces on the market, you will get a better look at the availability at what these braces have to offer you!